I am hot. The pit I’m in is deep, dark, dank, and depressing. Its walls are steep. Looking up, a light, a way out taunts me. To escape this painful place I must reach the light. I claw and climb to get there. The pit is where I struggle with myself to change my behaviors, attitudes, beliefs, and values. Three years ago, after a barrage of holiday ads, articles, and new fad products, as well as the admonitions of family, friends, and Santa to “be good” I invited weight-loss to join me in the pit. My New Year`s Resolution became shedding 45 pounds, my post-athletic paunch. Four months or sooner I proudly proclaim I will attain the goal. With well wishes from family, friends, and co-workers into the pit go weight-loss and I. Week 1 down a pound, week 2 up one, week 3 lost two, and week 4 gained two. A month in the pit, lots of clawing, weight-loss and I are even. If you have ever tried to lose weight, you know the helpless feeling I am experiencing. Weary, but undeterred, I figure, “There must be some trick.” So I seek advice from people who have beaten weight-loss. The trick they say, “Join a program”. Join a reputable program I do. After one month of meetings every Saturday at 8:30 AM, meal suggestions, dietary guidelines, daily point totals—I am 12 pounds down. Another month and I am down 11 more pounds. One more month, another 9 pounds lost. It seems the trick to climbing the wall is working the program. The next month, down 7 pounds, my goal is in sight. The light is mere inches away when my fingers fail (Actually, too long deprived, my fingers are tired from stuffing my mouth full of glazed doughnuts, peanut butter cookies, ice-cream with chocolate sauce, burgers, fries, and much more). Slipping, sliding, calories adding up, I tumble back into the pit. Thirty pounds later, back in my big boy suit, I put down the fork and regroup. Again I claw and climb—attend meetings, track what I eat, drink plenty of water, exercise—I work the program. Steadily I scale the wall. I want out of this pit. Twelve weeks pass, 26 pounds lost (re-lost), the bright light of my weight-loss goal is enticingly close. Goodbye weight-loss, hello good life. A Friday pizza party turns into a night on the town. A weeklong spat with a co-worker and subsequent binges follow. Then the market goes into a tailspin, munch, munch. Oh no! My grip loosens. To the bottom I slide, the pit darker and deeper than ever. Up 10 pounds, lying at the bottom of my pit, I stare at the light. It laughs. Then weight-loss spits in my face. Weary, embarrassed, and humbled I wonder, “Is this worth it? 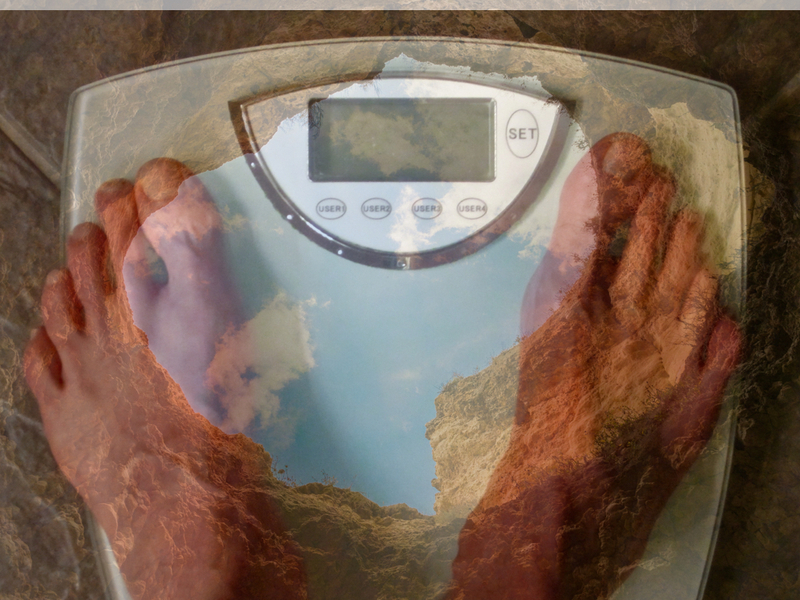 Should I give up?” At this moment, with weight-loss unattained and me grounded in the pit I realize that the lesson of this place is not about working a program or acknowledging and altering the gluttonous behaviors that enabled me to add 45 pounds. The lesson is that self-change is difficult, I am hardwired to resist, and that developing the habits of mind to change one behavior sets the stage to changing other behaviors. Struggle is how I grow and mature as a human being. While my behavior de jour is weight-loss, a limitless list of behaviors—negativity, abuse, pride, greed, lust, envy, gluttony, wrath, ignorance, and so on—are waiting to join me in the pit. All are eager to spur my growth each is ready to be my next teacher. As appealing as I may find no more points-to-count, meetings to attend, or weigh-ins to be, my penultimate question is not about weight-loss. It is about self-growth. Giving up, settling in the pit, perhaps even redecorating it, is a no-growth option. Same pit, same me, same dead-end. Giving up is not for me. My way forward—achieving my weight loss goal and learning how to become a better person in the process—involves embracing the struggle that the pit represents. Letting each claw, slide, tumble, escape, and return teach me what I need to know about myself. Armed with this insight, I re-engage with weight-loss. We grapple for another month. After which I deftly scale the wall of the pit. Give the light a big kiss, and offer a grateful thanks to my teacher—Weight-Loss—for my learning. I stand ready and eager for my next teacher, 45-pounds lighter. Are you pit bound? Weary and want to give up? Do not waste time seeking tricks and gimmicks. Confront the behavior you seek to change. Ask it, “Why are we stuck here?” The answer you receive—face yourself as a human being—is the way out of your pit-a-full-ness. This is the lesson of the pit. Learn it well. Note: This is the sixth post in the Learning Lessons series. Please click the follow button on the right side of the blog page to be notified of future posts.